DNA glycosylase OGG1 is essential for protection against mtDNA damage in NSCs. A, Sensitivity of wt and ogg1−/− NSCs to pro-oxidants. Single NSCs were plated in differentiation medium for 4 h before exposure. B, mtDNA damage detection by the relative quantitative amplification of a small (117 bp) and large (10 kb) of mtDNA. Top, A representative result. Bottom, The mean with SD from more than three independent experiments. C, mtDNA damage detection by the ability to inhibit restriction cleavage, quantified by real-time PCR. Data are mean with SD from more than three independent experiments. *p < 0.05; **p < 0.01. Differentiation of wt and ogg1−/− NSCs. A, Growth factor removal-induced differentiation of NSCs is manifested as reduced levels of nestin and corresponding elevations in the neuronal Tuj-1 and astrocytic GFAP markers. B, Progressive reduction of neurogenesis and increased astrogenesis from ogg1−/− NSCs. Left, Differentiating cells from wt and ogg1−/− NSCs are morphological similar (B-W, black and white phase-contrast images). Neurons and astrocytes at differentiation day 1 and 5 were identified by immunocytochemistry using antibodies against Tuj-1 (middle) and GFAP (right). C, Quantitative analysis of neurons and astrocytes at day 1 and day 5 in differentiation. Gene expression analyses, presented relative to wt at day 1. Data are mean with SD from more than three independent experiments. *p < 0.05; **p < 0.01. Altered redox levels and Sirt1 activation in ogg1−/− cells. A, Cellular redox levels were analyzed as NAD/NADH ratio in differentiation cells, as described in Materials and Methods. B, Sirt1 expression in cell cultures from wt and ogg1−/− NSC during differentiation. C, Redox manipulations correspondingly involve Sirt1. Sirt1 expression levels after treatment with oxidants [BSO and menadione (MEN)] and antioxidants (NAC and LA) were assessed by RT-PCR. All data are mean with SD from more than three independent experiments *p < 0.05. NSC mtDNA integrity determines differentiation capacity. A, Pro-oxidants shift differentiation toward astrogenesis in wt cells, but suppress total differentiation capacity in ogg1−/− NSCs. Cells were treated with BSO or menadione and astrocytes/neurons determined by immunocytochemistry at day 5. B, Antioxidants suppress generation of astrocytes in ogg1−/− NSCs with corresponding increase in neurogenesis. Cell were treated with NAC, LA and astrocytes/neurons identified by immunocytochemistry at day 5. 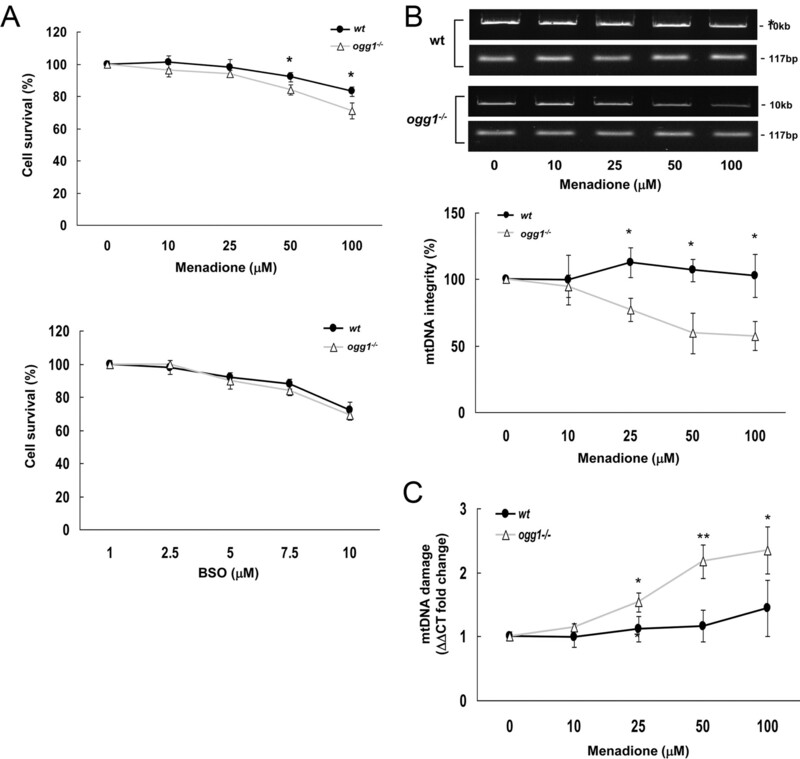 C, Strong 8-oxoguanine DNA glycosylase activity in brain mitochondria from transgenic ogg1−/− mice overexpressing mitochondrial hOGG1 (mtOGG1). Brain mitochondrial extracts (6 μg) from six different P5 littermates of mtOGG1 (1–6), adult wt (wt), and adult ogg1−/− (ogg1−/−) mice were assayed for OGG1 DNA glycosylase activity as described. Recombinant human OGG1 (25 ng) is used as positive control. 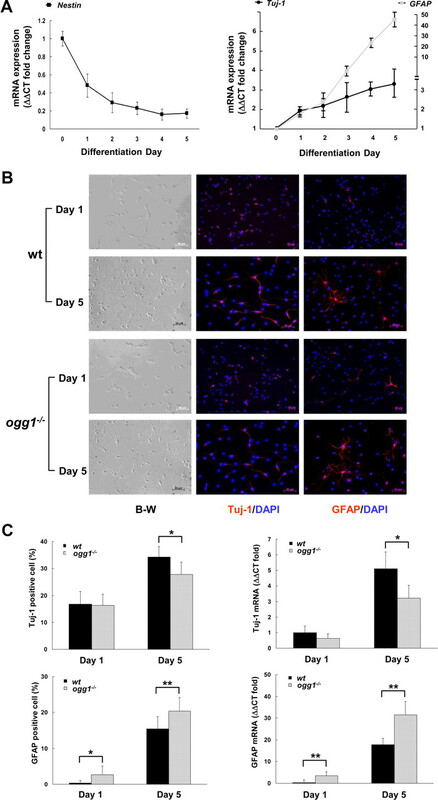 D, Reversal of spontaneous mtDNA damage by mitochondrial hOGG1 results in increased neurogenesis. Top, mtDNA integrity in cells from differentiation day 1 and 5 (D1 and D5, respectively) was determined as in Figure 1B. Numbers are average with SD from three independent experiments. Bottom, Spontaneous differentiation pattern in wt and ogg1−/− cells and ogg1−/− cells expressing mtOGG1, determined as in Figure 2D. E, Induced mtDNA damage in NSCs increases astrogliosis. Top, NSCs were treated with menadione and mtDNA integrity was examined as in D, after (1 h) and 4 h after treatment. Bottom, Different NSCs treated with menadione and recovered for 4 h as above, were cultivated in differentiation medium and the differentiation pattern determined after 1 d, as in Figure 2D. Results shown are experiments from two independent cultures. *p < 0.05, **p < 0.01. In this excellent paper on the effect cellular redox state on fate decisions of neural progenitors, Wang et al. report a connection between the levels of ROS and cell fate specification, with lower ROS levels enhancing neurogenesis and higher levels promoting differentiation towards an astrocytic phenotype. The proposed mechanism suggests an intriguing link between the level of mtDNA oxidative damage and the developmental behavior of neural progenitors. In our opinion, the results of this study could find application to another recent advance in the field of neural stem cell biology. The cell cycle mediator cyclin D1 was recently shown to hold a prominent, yet somewhat unexpected, role in fate specification of motoneuron (spinal cord) progenitors. Sustained expression of cyclin D1 during the initial stages of differentiation promoted the acquisition of a neuronal phenotype, while its downregulation coincided with differentiation towards a glial phenotype (Lukaszewicz et al., 2011). In various cell types, cyclin D1 has been confirmed to inhibit the expression and activity of many members of the mitochondrial enzymatic chain, leading to a reduced rate of oxidative phosphorylation (Sakamaki et al., 2006; Tchakarska et al., 2011). It is well known that the percentage of oxygen prematurely reduced to ROS during mitochondrial respiration depends on the rate of oxidative phosphorylation. Thus, on the ground of the results reported by Wang et al., the cell-cycle-independent, proneurogenic effect of cyclin D1 could also be attributed to its ability to reduce the redox state of spinal cord neural progenitors and thus the level of ROS mediated mtDNA damage. Sakamaki T, Casimiro MC, Ju X, Quong AA, Katiyar S, Liu M, Jiao X, Li A, Zhang X, Lu Y et al. Cyclin D1 Determines Mitochondrial Function In Vivo. Mol Cell Biol. 2006 July; 26(14): 5449-5469. Tchakarska G, Roussel M, Troussard X, Sola B. Cyclin D1 inhibits mitochondrial activity in B cells. Cancer Res. 2011 Mar 1;71(5):1690-9.